Good morning. It's Wednesday, Nov. 28. • Californians are undercutting climate goals by driving more. • The buyer of an auctioned storage unit finds $7.5 million. • And a look back at the sordid history of a 1933 mob lynching. 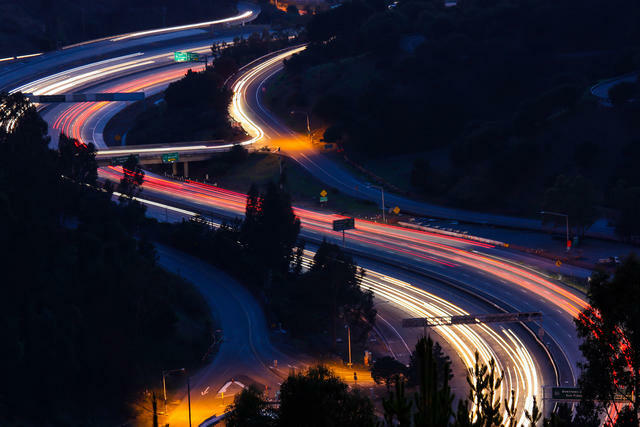 Cars followed the curves of Highway 24 in the East Bay. California has embraced some of the most ambitious clean air goals in country. Its regions, however, are undercutting the plan. A new government report found that the state is falling short of its climate change commitments because Californians are driving more, not less, and pumping out greater carbon emissions. The study blamed regional urban planning that has failed to build homes close to public transit and job sites. Read more about the report in the Sacramento Bee and L.A. Times. The private firefighting business is booming in California. With homeowners feeling increasingly surrounded by disaster, wealthy clients have turned to boutique insurers that offer so-called wildfire protection units. Regular firefighters aren't happy about it. They say the private forces pose another potential liability in the struggle to rescue residents and suppress blazes. 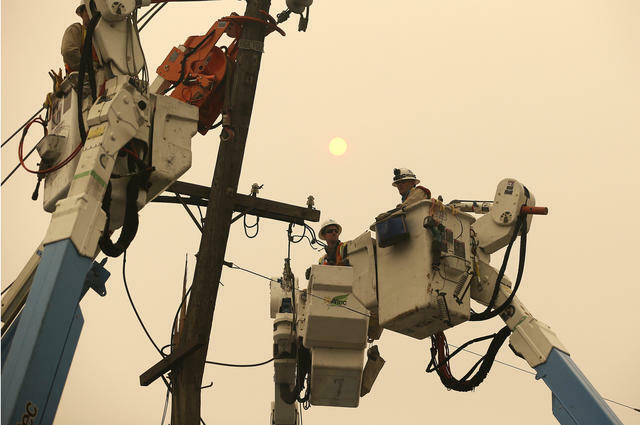 A PG&E crew worked to restore power lines in Paradise on Nov. 9. Investigators have not yet determined the cause of the Northern California Camp fire that began on Nov. 8, but speculation has centered on faulty PG&E equipment. Now a federal judge in San Francisco has directed the utility to account for any role it played in sparking California’s deadliest and most destructive wildfire. Separately, a Southern California businessman donated $1,000 checks to each of the 980 students and 105 employees of Paradise High School. A.P. Whiter, poorer, Trumpier. This year, 26 percent of Californians were represented in Congress by a Republican. Next year, that figure will fall to about 13 percent. Notably, no Republican will represent a district where less than a majority of voters favored Trump in 2016. Only Trump country remains. 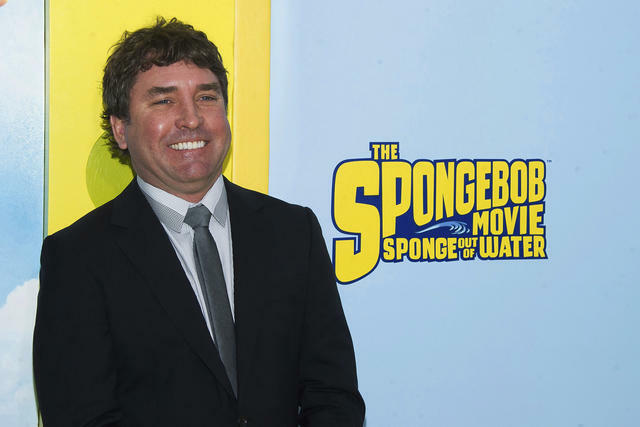 Stephen Hillenburg died at 57. A Humboldt State graduate and former teacher in Southern California, he created "SpongeBob SquarePants," a zany children’s show that became an unlikely cultural phenomenon. Hillenburg announced last year that he had Lou Gehrig’s disease. Tom Kenny, the actor who voices the show’s titular character, paid tribute to Hillenburg at an awards show in April. "SpongeBob's vocal cords might be mine," he said, "but SpongeBob's playful spirit of gentle anarchy, his humor and the joy he takes in his vibrant, colorful, music-filled world come directly — directly — 100 percent from my buddy, Mr. Stephen Hillenburg." 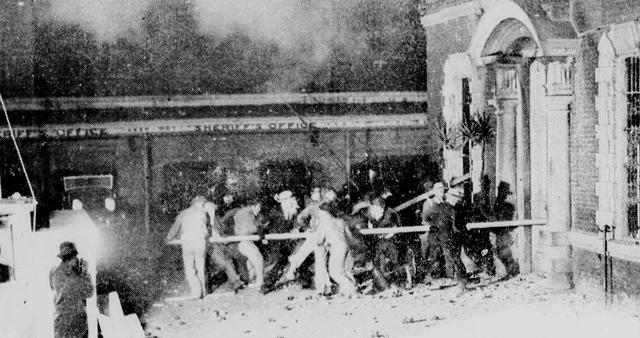 A mob bashed down the door to the Santa Clara County jail on the night of Nov. 26, 1933. On this week in 1933, a mob stormed the Santa Clara County jail, dragged two confessed killers from their cells, and hung them from the trees of a nearby park in what became known as "the last lynching in California." The governor’s reaction? Justice served. Today, the park is a centerpiece of San Jose’s downtown. No marker recalls its sordid history. A Stanford professor dove into an internet rabbit hole and discovered a dizzying network of shady Amazon storefronts and the strange religious community that owns Newsweek. The story was blowing people away on Twitter, where it was called "beyond belief" and "mind-bendingly weird." One reporter said it should get a Pulitzer. 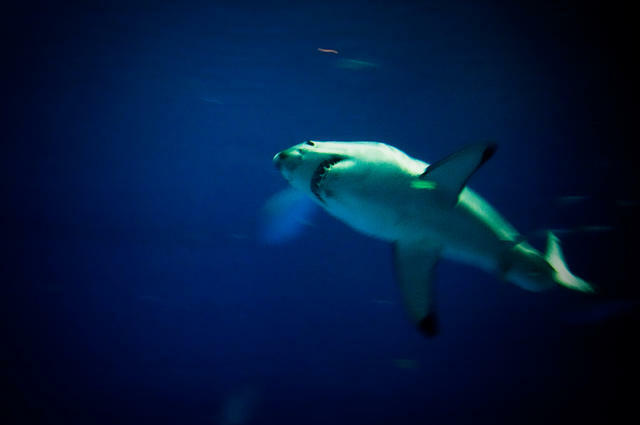 A great white shark, confined safely behind glass, at the Monterey Bay Aquarium. The placid waters of Monterey Bay have become home to one of California’s newest and most active populations of great white sharks. It's set off a drumbeat of news stories about frightening encounters with humans — "Aptos kayaker falls into water with great white shark" — along with another trend entirely: great white shark tourism. Those little plastic toiletries in hotels? Santa Cruz County is about to ban them in what is believed the first ordinance of its kind across the country. Instead, hotels will have to use the regular big bottles. The measure is intended to cut down on plastic waste. 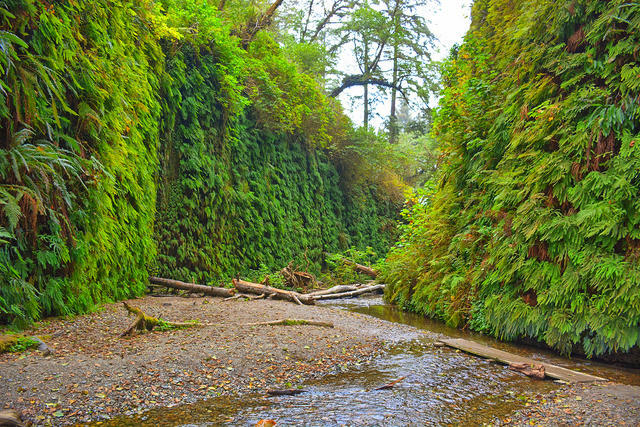 The vertical walls at Fern Canyon host a riot of moisture-loving plants. In Humboldt County, there's a narrow canyon where luxuriant ferns cascade down sheer 50-foot walls. Fern Canyon, tucked in Prairie Creek Redwoods State Park, is a portal into an ancient habitat that makes for one of California's most exquisite natural walkways. Steven Spielberg was so taken by it that he filmed part of his Jurassic Park franchise there. A street side memorial to the Borderline Bar shooting victims was filled with flowers in Thousand Oaks on Tuesday. 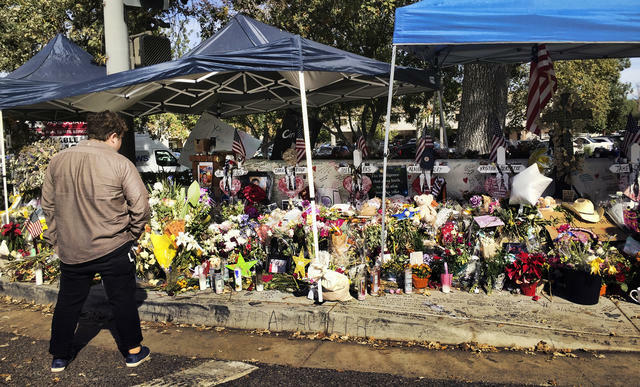 Three weeks after a former Marine killed 12 people at a country dance bar in Thousand Oaks, California, investigators said they are stumped about his motive. At a news conference, Ventura County Sheriff Bill Ayub said Ian David Long, who took his own life, did not appear to have been radicalized and left behind no written manifesto. The buyer of an auctioned storage unit in Southern California opened it to find $7.5 million in neatly bundled cash. That led to a conversation between the new owner (who remained anonymous) and a lawyer for the original owner. A deal was reached to let the buyer keep $1.2 million and return the rest — not a bad a return on a $500 purchase. 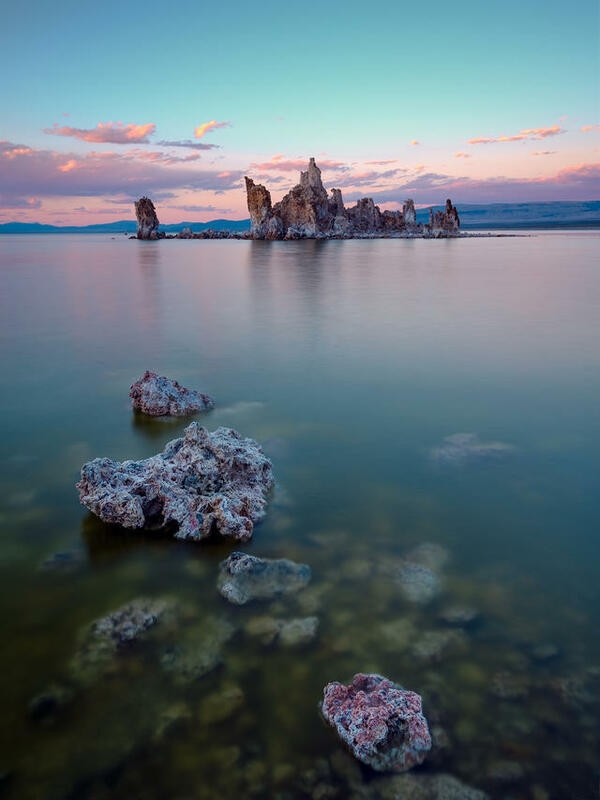 Mono Lake features eerily beautiful tufa formations. The tufa towers of Mono Lake look like they sprang from the mind of Dr. Seuss. One of the grand landscapes of the American West, the ancient lake is surrounded by snowy peaks and glacier-carved canyons. Yet its charms haven't worked on everyone. Mark Twain called the setting "a lifeless, treeless, hideous desert" and the lake "a lonely tenant of the loneliest spot on earth." 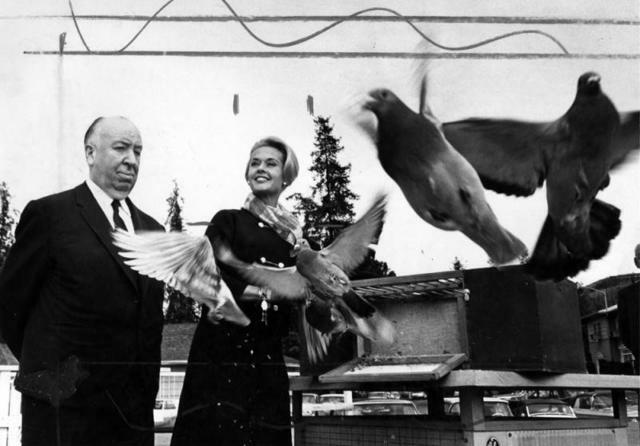 Tippi Hedren, at a movie promotion with Alfred Hitchcock, in 1963. The Vietnamese-American nail industry originated with an act of kindness by a Hollywood actress in 1975. After the fall of Saigon, tens of thousands of Vietnamese refugees arrived in California. Tippi Hedren, the star of Alfred Hitchcock's "The Birds," volunteered to help at a refugee camp outside Sacramento. The immigrant women, Hedren told Nails Magazine in 2015, were fascinated by her polished fingernails. "They were long and coral," she said. "I asked my manicurist, Dusty, to come up and teach them how to do the Juliette manicure. All I wanted to do was find a wonderful career for these 20 women that I just fell in love with." Hedren with refugees she helped train as manicurists in an undated photo. The Vietnamese-American nail industry was born. 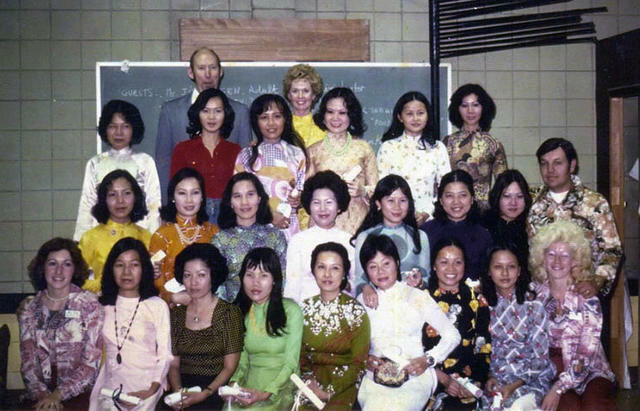 The students of Hedren's manicurist became among the first Vietnamese women in the U.S. to get their nail licenses. A few opened salons. Friends and family were recruited into the "mani-pedi" business, which was reshaped to cater to everyday women, not just the well-to-do. In time, the Vietnamese diaspora grew to dominate the $8 billion nail salon industry. Hedren, who has been honored numerous times as a hero to the Vietnamese immigrant community, now runs a wildcat preserve north of Los Angeles. In a BBC interview a few years ago, she joked about the butterfly effect she unwittingly set in motion. "I sure wish I had a percentage of it," she said. "I wouldn't be working so hard to keep these lions and tigers fed."